Really Bad Reporting in Wisconsin: Who ‘Contributes’ to Public Workers’ Pensions? When it comes to improving public understanding of tax policy, nothing has been more troubling than the deeply flawed coverage of the Wisconsin state employees’ fight over collective bargaining. Accepting Gov. Walker’s assertions as fact, and failing to check, created the impression that somehow the workers are getting something extra, a gift from taxpayers. They are not. 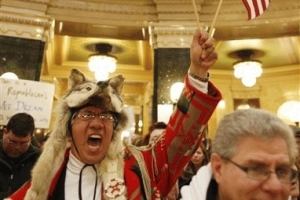 Arnold Chevalier, left, of Stoughton, Wis., shouts inside the State Capitol, Feb. 21, 2011, in Madison, Wis. Recent events in Washington and Wisconsin have me thinking that maybe we should just go ahead and change the national motto to something more truly reflective of today’s America. Forget “e pluribus unum” with its elitist overtones. Also, what people who make a big thing over “In God We Trust” really mean isn’t so much that they approve of the deity, as that God approves of them.